Participants in character playing the College of Wizardry larp. Live action role-playing—or larping—has garnered thousands of fans and soared in popularity over the last decade. Larp expert Lizzie Stark demystifies this deeply expressive form of storytelling. I have many personas. Like most people, I select particular social masks for different occasions. Among my personas are those of business woman, granddaughter, and friend. All of these social roles are distinct, and they come with distinct modes of conversation and costuming. I make ribald jokes with my friends, but never my grandmother or editor; I watch movies in my pajamas with my grandmother and friends, but dress appropriately for that networking coffee. In other words, I calibrate my appearance and behavior—my persona—as best I can, according to the situation. Everyone does. I can channel any one of more than a dozen social masks—taskmistress, loving wife, or zany artist—during the day as needed. The stories larp tells are quite diverse. You might play hobbits trying to save Middle-earth; members of a rural Oklahoma community locked in a bomb shelter after the Cuban Missile Crisis goes awry; or fairy tale creatures at a union board meeting. The only limits are the imaginations of the game designer and her player. The essence of larp is experiential. Participants meet up in real time and space, guided by a facilitator and constrained by the world the designers have built, take on the role of a character, and play out their own character arcs. Sometimes the relationship between the game world and the real world is direct, and sometimes it is symbolic. You can assemble a beautiful costume and play a game about life in a wizarding college in a real life Polish castle, where everything you see is present in the game, as players did in the larp College of Wizardry. And you can live in that reality for days at a time. This is called a 360-degree aesthetic—it’s a larp played in an environment as close to the production’s real setting as the larp designers can reasonably get. Time moves at the same speed both in and out of game—a ten minute walk takes ten minutes in the real world as well as the larp universe; your character looks like and is wearing whatever you are wearing; the game setting is a castle and you are in an actual castle. Plenty of larps eschew the window-dressing. Freeform and black box larps make use of space and time symbolically. Set in unadorned conference rooms and classrooms, these productions don’t require fancy props, set, or costuming. If power of imagination can transform you into the personification of “tethered love,” as in Peter Fallesen’s Let the World Burn, then what you’re wearing is probably irrelevant. A disposable coffee cup can easily stand in for a bouquet of flowers, an urn for grandmother’s ashes, the world’s last bowl of soup, or anything else that is physically needed. In this style of game, designers can telescope time in and out. We can play out the first flirtation between two characters, as in Emily Care Boss’ Under My Skin, cut to the next flirtation a week later, and play out the entire character arc of infidelity of several couples in a little under five hours. Or perhaps we play the same five-minute scene over and over again for two hours until we have discovered every iota of nuance present. Larps vary widely—in the stories they tell, in the production values they require, the amount of time they last, and the tools they use to heighten and calibrate the story. Over the last five years, I have spent transformative hours as a young man at the height of the AIDS epidemic; helped allocate a family inheritance by breaking numerous china coffee cups; lived as a servant in Jane Austen’s world for four days; and transformed the flavor of garlic into a character, a second-generation immigrant desperately trying to hold family tradition together. I’ve been a refugee, a settler, a douchey mountain-climber, a manic pixie dream girl commando, a professional nail technician, the democratically elected dictator for life of a space colony, and a ghost suing for possession of the kitchen I haunt. To think of larp as becoming a completely different person is both true, and a fundamental misunderstanding. As in all art, my experience as Benny was made more meaningful through the designer’s use of structure and techniques. I Say a Little Prayer featured, among other things, a thematic act structure. Every act concluded with a lottery of death, designed to represent the randomness and terror of the early AIDS epidemic. Each surviving character put at least one ticket into those lotteries—more, if they had engaged in risky sexual behavior. During the act breaks, the facilitator drew a name out of the hat, a character died, and we held a funeral that represented our connection to the dead character with touch. I still don’t know what it was like to be a young gay man at the height of the AIDS epidemic, but by playing one in this larp, I have a better understanding of what it might have been like. I had to recognize the shared humanity between Benny and myself. And in doing so, I also put on and connected with certain parts of my personality, for example, the part that is terrified by the early death of people I love. There’s my friend Cheri, dead of metastatic breast cancer at 35; my cousin Kitt, dead of a skiing accident at age 19; or the litany of female relatives whose genetic error I share, dead of breast and ovarian cancer quite young. Larp manipulates the social masks we have inside of us for many purposes—catharsis, aesthetics, and even fun. Because larp allows players to tap into their fundamental personal essences, it allows participants to connect with each other very deeply in very short amounts of time. As I said at the outset: larp manipulates the social masks we have inside of us for many purposes—catharsis, aesthetics, and even fun. I sometimes think of core personality as being a bit like a river of liquid rock—no one vessel can contain it completely, though it can be channeled into manageable eddies, and scientists can safely sample it in small quantities and purpose-made containers. In other words, as Walt Whitman put it in Song of Myself, “I am large, I contain multitudes.” Every human embodies multiple identities—we are mothers but also daughters and granddaughters, writers but also amateur chefs, jokers who can be deadly serious when the situation demands it. Together, these roles and how we approach them—each its own eddy of the lava flow—make up our core humanity and identity. 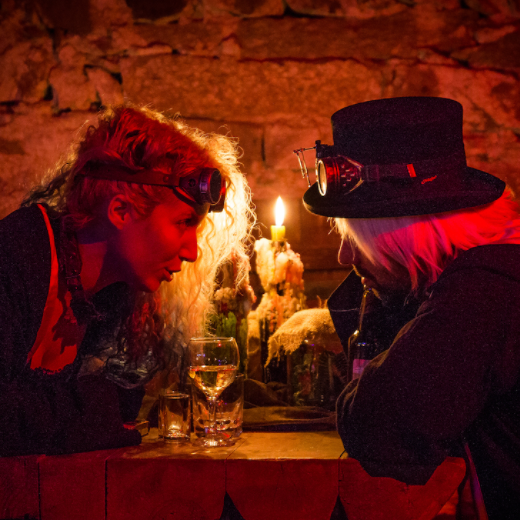 Because larp allows players to tap into and perform their fundamental personal essences, it allows participants to connect with each other very deeply in very short amounts of time. And it does this both by asking participants to play roles, and by asking them to improvise all their own lines. They are themselves, but different. Consider improv theater pioneer Keith Johnstone’s advice on the form (which is connected to but not identical with larp). Johnstone advises improvisers to “be obvious” because your obviousness is really your true self; it comes out of you and will therefore be different from my obviousness. If I ask you what you’d bring on our trip to Mars and your first impulse is to say, “a Kenny Loggins tape,” then you’ve revealed something about your true self. This stands in stark contrast to traditional social situations, where the lines we utter can be almost scripted—polite conversation consists of exchanging pleasantries—and those scripts remain remarkably similar across different social situations and individuals. Consider the narrow range of appropriate responses to the question “How you doing?”; “Fine. You?”; “Good.” The wild situations and setups of larp free us from these socially prescribed exchanges, and in doing so, open up possibilities for deep human connection. In the second installment of Lizzie Stark’s essay on larping, she explains how the role-playing game provides alibi for an experience. Lizzie Stark is the author of Pandora’s DNA, which explores the history and science of the so-called breast cancer genes, and Leaving Mundania, which investigates the subculture of live action role-play, or larp. Her journalism and essays have appeared in the Washington Post, Daily Beast, io9, Fusion, and the Philadelphia Inquirer.